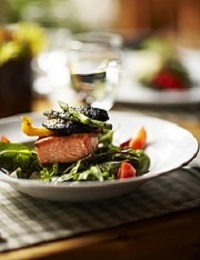 • Salmon — This fish is high in omega three fatty acids. This fat can help lower your triglycerides, a type of blood fat that can increase your risk for heart disease. Other options are trout, sardines, tuna and mackerel. Try for two servings a week. A serving is the size of a deck of cards. • Oatmeal — Old fashion or steel cut oats have a type of fiber that helps lower your cholesterol. Try to avoid instant oatmeal as it may have added sugar and be low in fiber. Other whole grains like whole wheat bread, wheat pasta, and brown rice are also good for your heart. • Nuts — Studies show that certain nuts can lower cholesterol and your risk of heart disease. Almonds, walnuts, pistachios, and peanuts are best. Aim for about a quarter cup a day of nuts. Avoid eating nuts with added salt or sugar. • Olive oil — It has a healthy fat called “monounsaturated fat.” These fats can lower your levels of bad cholesterol which may reduce your risk of heart disease and stroke. • Avocados — They contain monounsaturated fat too, which is good for our heart. They also are high in potassium which may help with lowering your blood pressure. • Dark Chocolate — It contains flavonoids, which can help decrease the bad cholesterol from sticking to your artery walls. It may also help with lowering blood pressure and reducing blood clots. Look for dark chocolate with over 70 percent cacao content. Eat one ounce two to three times a week. • Berries — Most berries contain polyphenol. Polyphenols can help get rid of damaging substances called “free radicals.” Berries also contain vitamin C and fiber both which can be helpful in reducing your risk of a stroke. Of course, eating just one of the above foods is not enough to improve your heart health. It is important to eat a variety of foods. This includes fresh fruit and vegetables, whole grains, and lean protein. Other important habits for your heart include daily physical activity and quitting tobacco. For more information, please call a dietitian at Providence Hood River Hospital at 541-387-6379 or 541-387-6133. Healthy Active Hood River County (HAHRC) is a community healthy living coalition promoting wellness through increased physical activity, healthy eating, tobacco use prevention, behavioral health, prevention of addictions and policy and environmental change. Join them at their next meeting on March 28 from 11:30 a.m. to 1 p.m. at Providence Hood River Hospital Conference Room 5.